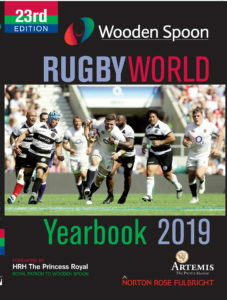 Tying in with the Six Nations Rugby Internationals is the release of the 23rd edition of the Wooden Spoon Rugby World Yearbook 2019. With a foreword by HRH Princess Royal, many of the country’s leading rugby writers reflect on the happenings of the past season and look ahead to what is in store this year including the World Cup in Japan. All aspects of rugby – club, internationals, women’s, sevens, youth – are all covered in a book which celebrates winners around the world and also tackles some of the issues that rugby faces as it continues to attract larger audiences both at the grounds and on television. Edited by legendary BBC Rugby Correspondent Ian Robertson, the £20 hardback is also available as an Ebook via this web-site. Sir Alastair Cook, who received a knighthood in the New Year Honours list – the first England cricketer to do so since Sir Ian Botham in 2007 – is the most prolific Test batsman the country has produced and one of the finest openers to grace the game. Tieing in with World Autism Awareness Day on April 2nd is a new children's book, Oliver Storm and the Great Disappearance which has been written by a severely autistic boy Freddie Ellison. Freddie is being seen as a shining example of what autistic people can achieve and will be appearing on Good Morning Britain on April 4th and Sky News on the 2nd from 11am to support the Awareness Day. Enter the hallowed halls of our House of Common Nonsense in this weeks funny cricket podcast. We discuss England's winter and unearth a fiery debate. House Of Common Nonsense - Howzat For A Laugh?! 📌 Set up for an unforgettable season!